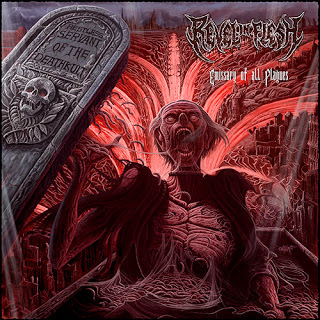 Following their usual style, German death metallers Revel in Flesh have been at the forefront of the Swedish-style grinding death metal fervor that was apparent from the beginning. Taking two years once again to get this one released, the bands’ fourth full-length effort was issued December 2, 2016 on Cyclone Empire. As was apparent from the onset here, this is a tried-and-true homage to the blistering, pounding death metal featured in the Swedish style from the early 90s. Tracks like the title track, Servants of the Deathkult and Torture Throne offer predominantely a part of the swirling groove-style of riff-work heavily featured in that scene, using this buzzsaw style of attack to generate a feverish energy and infectious bursts of aggression in this old-school style of worship throughout here. This is not only prevalent in high quantities throughout here, but it works rather nicely to buffer out the prominent melodic aspect featured here with the band employing a highly-developed sense of melody-driven rhythms in Casket Ride, Fortress of Gloom and Lord of Flesh that were introduced sparringly in the previous release but come off with more focus and intent here. This highly-focused melodic bent being the prominent element to their attack makes this come off rather nicely yet also manages to cause the album a rather distressing flaw in being just way too simplified in the riff-work in order to accommodate the melodies. This is rather unchanged and simple-minded at times as though the performances are strong and engaging there’s little else about this one to really get worked up over with the simplicity of the riff-work. Though this is a big factor, there’s not much else here.